It's been a long time...a very long time. For the most part I've been seduced by nature. The shear beauty and expansiveness of the majestic mountains in Western North Carolina have lulled me into a slumber-like trance almost to the point of inertia. It's only a strong desire to chronicle my experience and share my thoughts that brought me out of this comatose state. Nature has been (and still is) my frequent companion and benevolent teacher. You never know what you'll experience when you open yourself to the adventures of the great outdoors. The other day I went hiking deep into the woods with a friend who I'm sure must be a direct descendant of Tarzan with a little bit of mountain goat blood in her. 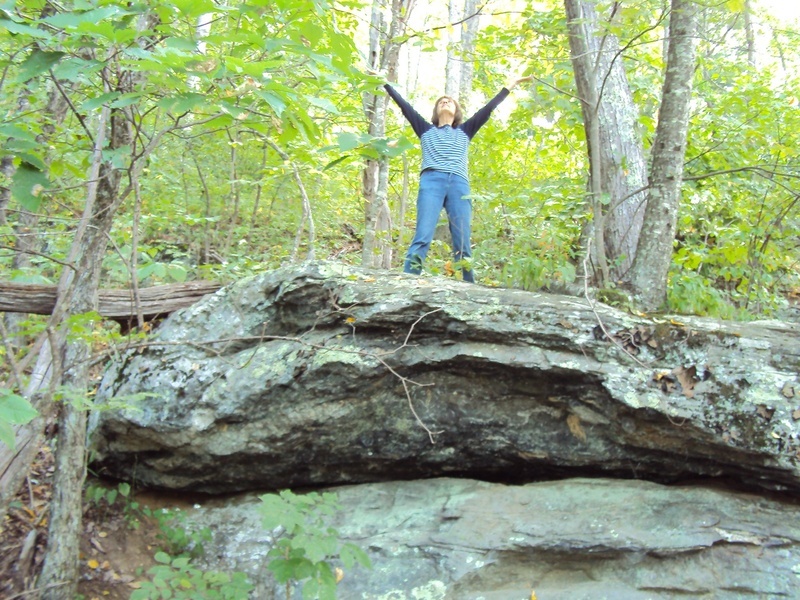 She has been exploring these woods for well over a decade, hiking off-trail to the most pristine and magical places. Hiking with her can be both challenging and fun and is often a mixture of both. On one particular day we traversed the mountains somewhere east of Asheville, weaving around thick brambles, crisscrossing hidden streams, going up and down these gorgeous monuments of nature until we finally reached a mountain ridge that was home to a very special climbing tree. I've nick-named the tree Sophia. My hiking companion skillfully climbed Sophia, securing a position on her lowest branch about three feet off the ground. She stood on the branch, then hugging the Sophia's trunk swung her body around the trunk until she was standing on another branch on the opposite side of the tree. After enjoying the expansive scene before her, overlooking mountains as far as the eye could see, she quickly retraced her steps. With both feet again firmly on the ground she looked at me and said, "Ok, now it's your turn." Really? Now I do love an adventure and a challenge but that lowest branch looked pretty high off the ground to me. Plus, there was no safety net to catch me if I lost my balance. But my adventurous spirit would not let me pass up this opportunity. After a slight hesitation I cautiously agreed to attempt to climb to the lowest banch. A conveniently-located notch in the tree trunk gave me a strong foothold for anchoring my right foot and positioned me to a point where I could swing my left leg onto the tree branch and hoist myself up. I did it! Within a minute I was comfortably sitting on the welcoming arm of Sophia, feeling quite relaxed and proud that I stretched myself (both literally and figuratively) to this new position. Somehow sitting on that branch with my feet dangling in the air made the view before me much more majestic, much more expansive. Maybe it was because I felt more expansive. I stretched myself to do something I hadn't done in over six decades and was savoring the deliciousness of my accomplishment. Little did I know that my adventure was far from finished. After a few minutes of basking in the glory of my accomplishment I received a very strong nudge to stand on the branch. This was not an ordinary nudge but a "you're safe to stretch even farther" nudge that I felt was directly from Mother Nature herself. And one cannot ignore Mother. So I carefully tucked my feet underneath me and holding on to the Sophia's trunk ever so slowly raised my body to a standing position. Instantly I felt a rush of exhilaration fill every cell in my body. I was off the ground, standing in a tree, looking at the radiant beauty of the endless mountain ranges that stood before me. My heart was overflowing with gratitude and appreciation. It was as if I was at one with nature and all of creation. I was not looking out at nature, I was actually a part of it. It was the perfect day for hiking, pleasant weather, just the right mixture of sun and clouds and a gentle wind that brushed your cheeks with the freshness of outdoors. I took advantage of these optimal conditions by enjoying a 3 1/2 hour hike on one of my favorite trails. While the entire hike felt like a blessing and filled my heart with much gratitude, it was the last five minutes of this adventure that really touched my heart. I was relishing the peace and tranquility of my hike when suddenly I heard a loud snort behind me. I turned around quickly and noticed a momma bear chasing her young cub up a tree. Not wanting to mess with momma, I just as quickly turned back to my path to continue my hike. But my curiosity got the best of me. The cub looked so cute and it is a rare experience to witness a mother and her offspring so close. Could I get another look at this precious sight. So I once again turned around on my path, but this time to find momma staring directly at me with an intense look that said, "Don't you dare mess with me or my baby!" Without hesitation I immediately pivoted back to my path hiking at a faster than normal pace, never looking back again. This encounter was too close for comfort so I was greatly relieved to find myself safely at the trailhead a few minutes later. Bear itself is an intriguing animal that holds deep symbolism. Because of its practice of going into hybernation or semi-hybernation during the winter months, it is often linked to introspection or going within for the purpose of birthing something new. This was especially relevant to me since I had spent the last few months of winter thinking about a number of projects that I wanted to bring to fruition. Seeing the cub was a sign to me that it was now time to give birth to those projects. This was also reinforced by the cub climbing up the tree. The tree is an ancient and powerful symbol, often seen as a link between heaven and earth. It is also a symbol of fertility and growth. "Branch out and share your projects with the world" was the message I heard. Finally momma bear was telling me to watch over and protect my projects, just as she was protecting her cub. Give them freedom to grow and evolve, but direct them ever-so-gently to unfold as a product of my passion. To have all of this happen on Mother's Day was so significant. Nature never misses a beat, or an opportunity to gently push us forward. Thank you, Gaia, for the message AND for the extraordinary experience of seeing nature up close and personal......AND for bringing me safely back to the trailhead. What an adventure!!! What has been a help in the past can turn into a hindrance in the future. I think about this in terms of our living quarters. Our previous home in Michigan was a beautiful home, well-maintained and very comfortable. In fact it was getting too comfortable. What had sheltered us for almost 40 years, providing us with a safe place to grow and expand had slowly begun to feel like a confined and restricted habitat. The growth stopped along with the expansion. It was a safe and secure place, for sure, but it no longer fed our spirits. What helped us grow in the past had now become a hindrance to any future growth. We knew that if we wanted to continue to expand and experience new adventures in life, we needed to change our environment. We needed to move. We sold our home and moved to a different city in a different state, a city in which we casually knew only one person. Asheville is a magnificently beautiful city that is surrounded by mountains and forests, lakes and waterfalls, rivers and rapids. While this move has had many ups and downs, we don't regret for a moment that we made the change. Through all of the challenges, all the new and exciting adventures, we felt (and continue to feel) more alive than we have ever felt. It is this aliveness that feeds our soul and confirms for us that we made the right decision. The picture below was taken on one of our hikes in the mountains and expresses how we feel about life. There are no guarantees in life, but there are missed opportunities. You can play it safe and stay on the beach, wondering what it would be like to be splashing about in the crystal-clear water. Or you can ever-so-cautiously dip your toe in the water slowly easing yourself into a different environment. Or you can risk it all and jump in the lake with both feet even before you know the temperature of the water. Maybe today is your day to jump. If so, jump with full abandonment and enjoy the adventure. It has been over two months since we arrived in Asheville, North Carolina. Moving from our home of 41 years in Michigan to look for a permanent residence in another state almost 700 miles away has been a rigorous, sometimes grueling, process. If it weren't for the breathtaking woods that cradle our newly-adoppted city, we might have gone insane, or at least collapsed, under the relentless pressure of such a monumental undertaking. But most of the challenge is behind us now and for our tireless efforts we are rewarded each day with a brand new experience that never fails to delight our senses. The majority of these experiences take place in nature. 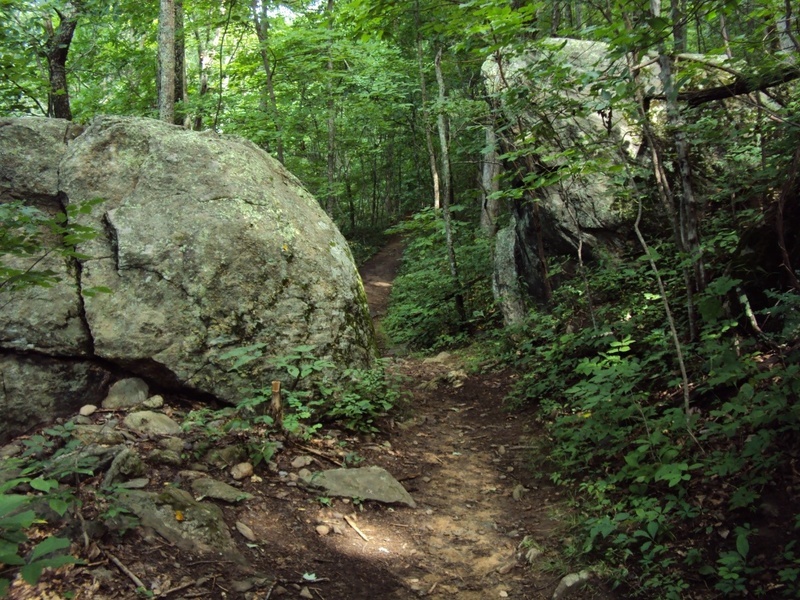 The picture above was taken along the Rattlesnake Lodge trail in the mountains near the Blue Ridge Parkway. This is just one of the hundreds and hundreds of trails that now are literally at our doorstep, just minutes away from where we are currently renting. Rattlesnake Lodge was the summer home of Dr. Chase P. Ambler and family beginning in 1904. Their enjoyment of this pristine area was unfortunately short-lived. After his wife died in 1918, Dr. Ambler never returned to the estate. When he finally sold it in 1926, a fire destroyed much of the home that very same year. 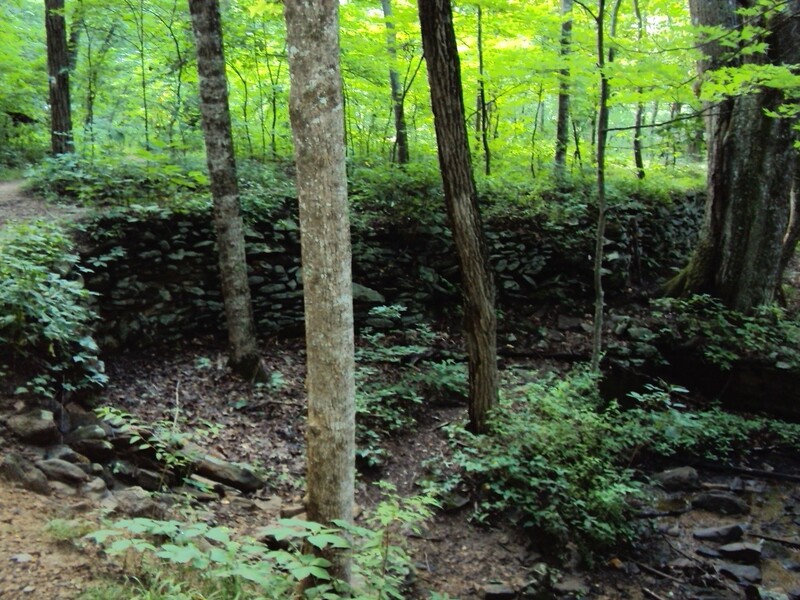 What remains now are only a handful of stone structures and walls, leaving much to the imagination of the onlooker. 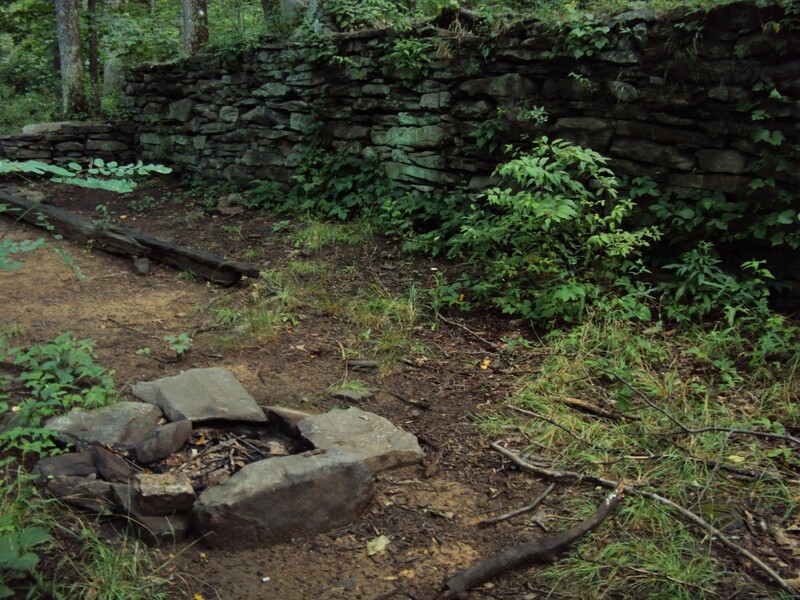 Below are more pictures, along with adjoining paths. Helen Keller once said, "Life is either a daring adventure or nothing." With both of us hovering around age 70, one of us slightly above and the other slightly below, we took a bold step to leave our familiar surroundings and embark into unknown territory. After a little more than two months we can attest to the fact that life can be a daring adventure, regardless of your age. We are so grateful to be living that adventure every day of our lives. One of the gifts of Spring is the recognition that we live in an increasingly abundant universe that is continually birthing new wonders for us to enjoy. Walking in the woods these days reveals this unparalled abundance in nature. Wildflowers everywhere, a constant chorus of bird song, tons of squirrels, lush green plants of endless variety and countless trees displaying various shades of green leaves have transformed the woods into a visual feast. There is so much that catches your eye and welcomes you into this magical paradise. Two things stood out for me on today's walk: the presence of a particularly unusual squirrel and the rushing waters of the river. Putting together these two nature beings the clear message was, "Things are moving fast, so be prepared." No one will argue that things are constantly changing at what seems like a frantic pace. We hardly have time to think about how we want to respond to all these changes and often just tumble along with them. But there is a way to live more consciously and nature is one teacher that can show us how it is done. The energy of squirrel asks us to prepare in a conscious way and honor our future by readying ourselves for change. One way to do this is to lighten your load if you have gathered too many things. These things could include thoughts, worries, pressures, stress or gadgets that have not been used or broken for years. As my husband and I prepare to move from a household that we've occupied for more than 40 years, I'm amazed at how many items we've collected and stored, but no longer use. Now that we actually have to pay to move these items to our new location, we are looking much more discriminately at each one. It amazes me how many of these items I can now release. I know as each item leaves our home, whether it's a couch or book, we always feel a little lighter. Walking in the woods has helped to balance out the demands of selling a home and making an out-of-state move. We need the woods now more than ever and it never fails to accommodate our needs. When things get a little frantic, we always find in the woods the peace and reassurance that everything will work out. And surprisingly it always does. The woods have always been a safe haven for me, lifting my spirits and providing endless hours of unsurpassed joy. Occsionally this natural playground also offers an uncompromising wisdom that helps to smooth out some of the bumps on the winding road of life. When this happens I feel much richer for the experience. As I entered the woods the other day I was devastated at what I saw. Dozens and dozens of trees had been cut down, leaving piles of branches and tree trunks litering the usually pristine landscape. Walking farther along the path, the sound of chain saws and fallen branches told me that the destruction was continuing. It was not an uplifting day in the woods. But I soon reached my destination, a small make-shift tee-pee nestled about 10 yards off the beaten path and hoped that the comfort of this sacred hide-away would ease my grief. It did that and much more. Standing within this sacred hide-away it occurred to me that I could hear the delightful sound of birds singing in a brand new day to my left while the dreadful sound of chain saws filled the air to my right. It struck me that I had a choice. I could align myself with the birdsong, focusing on the beauty that was present or I could put my attention on the chain saws and the seemingly senseless destruction that was taking place. I decided to focus on the beauty, even while things were crumbling around me. Awareness #1: focusing on the good brings more of it into the world. Just thinking about this lifted my spirits and added a light-heartedness to my return trip. As I crossed the river to leave the park, Awareness #2 set in. I realized that only the blissful sound of the birds filled the air. Destruction may come and go, but what is good and beautiful will prevail. Said another way: the Light trumps the dark every time! The lessons didn't end there. It turns out that the tree destruction was actually part of a $1.5 million dollar project to save the integrity of both the woods and the river. For many reasons the riverbanks were flooding, eroding the land nearby and causing trees and branches to fall into the swift-flowing waters. The wood from the cut trees would be used to reinforce the riverbanks, preventing further erosion and saving even more trees from tumbling into the river. Awareness #3: Seeing the bigger picture often reveals a different story. What at first seemed like senseless destruction actually served a higher purpose. Perhaps that's also true of what is happening in the world at large. What is crumbling today may be paving the way for a more evolved, highly-functioning society tomorrow. I hope so. Sometimes it's the little things in life that touch us deeply and lift our spirits on an otherwise ho-hum day. Perhaps these little things have such a big affect on us because they simply are just that....little things. They may not solve any world problems, or even personal ones for that matter, but they play a significant role in brightening up our day. They are reminders that life is about more than work and obligations. Walking along a narrow footpath in the woods I spotted a light green object leaning against a tree about 10 yards ahead of me. Did someone lose a cherished item? Or was is carefully disguised liter? 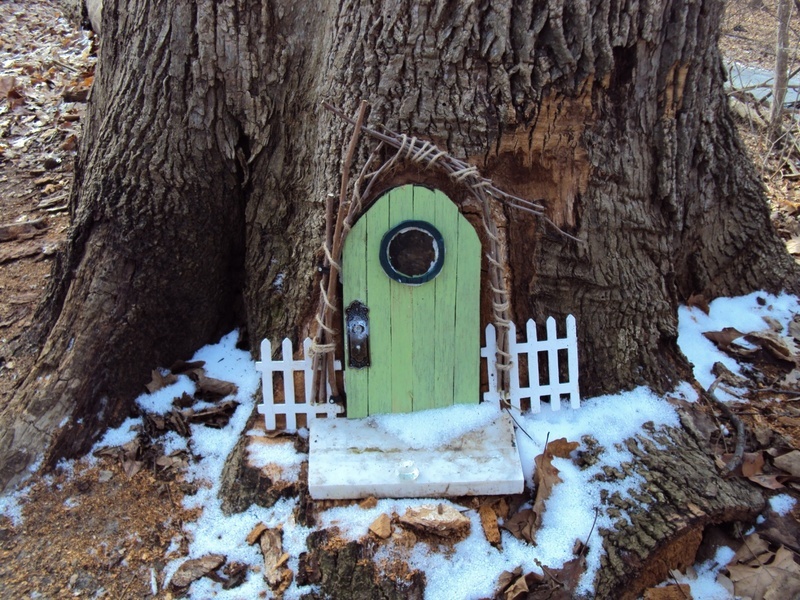 As I approached the object in question I was surprised to discover that it was a fairy door! As you can see from the picture below, this entranceway into another world included a decorative branch perched above a sculpted door that even included circular window, a decoratiave door lock and an elegant white marble stepping stone nestled at its base. What a charming door, indeed! It really warms my heart to think that someone would take the time out of their busy life to construct such a whimsical object and place it anonymously in a public area just to add a little bit of happiness and joy to the lives of all who gaze upon it. What a beautiful expression of love. And what a beautiful confirmation that there are people in this world who do care about others, who give generously of themselves and who make a positive difference in our lives. I just love walking in the woods. Exercise is important if we want to maintain a healthy body. So is a healthy diet. In spite of this, too many people will come up with a variety of reasons why they can't incorporate exercise or healthy foods into their lifestyle. "I don't have the time" or "I don't have the money" or "I'm just not motivated" are just a few of the reasons cited. Oftentimes excuses such as these seem to give them a certain justification for following an unhealthy lifestyle. While these excuses may or may not be valid there is something else that everyone can do at any time to positively impact their health. That something is to take deeper, equanimous breaths. We take approximately 20,000 breaths each day. This adds up to a whopping amount of around a hundred million breaths in our lifetime. It stands to reason that if we change something that we do on such a large scale our health will change as well. Research supports this. In fact it has been said that even a tiny improvement in the way we breathe can bring profound shifts in our physical, mental and emotional well-being. Taking deeper breaths is a good place to start. Less than one-tenth of a liter of blood flows through the top third of our lungs every minute. Contrast this to two-thirds of a liter that flows through the middle part of the lungs and a full liter of blood that flows every minute through the bottom third of our lungs. So the more deeply we breathe, the more oxygen we take in every minute, and this is important because each one of our 75+ trillion cells in our body needs oxygen to function efficiently. The lungs are huge! They are composed of tiny grape-like clusters of air sacs called alveoli; this is where the contents of air are exchanged. If you opened all the alveoli in the lungs and spread them out, they would blanket a basketball court. But if we take shallow breaths during most of our day, many of these aveoli go unused. Remember that old saying, "If you don't use it, you lose it." Well, shallow breathing can lead to premature loss of lung function as we age. Another interesting point to consider is the percent of oxygen and carbon dioxide in inhaled and exhaled air. The air we breathe in is made up of around 20% oxygen and 1% carbon dioxide with the remainder composed of nitrogen and irritants. The air we exhale contains around 14% oxygen and 5% carbon dioxide. Taking a deeper breath is usually followed by a stronger exhalation, so more carbon dioxide is released from the body. If we only take shallow breaths there is a risk of abnormally high blood levels of carbon dioxide in the body, which can lead to a plethora of health problems. It can adversely affect blood pressure, cause nerve damage, impair resperatory function and lead to acidosis. In other words, it can take the spring out of your step. So how do we change our breathing? You can begin by becoming consciously aware of how you breathe and then take the time to breathe differently. Spend five minutes every morning focusing on the breath. Take a deep breath, engaging the lower part of the lungs for a count of three or four seconds. Hold for the same amount of time and then exhale for the same count. Hold after the exhale for the same amount of time and then repeat the entire process. It is important to do this consciously in a relaxed manner. If holding the breath for a few seconds causes anxiety or uncomfortable feelings, then simply focus on a deep inhale followed by a deep exhale. The key word here is SLOW. Don't hyperventilate. Do this slow, conscious, deep breathing periodically throughou the day and again for five minutes in the evening. After a few weeks of this practice you will be amazed at how much better you feel. And all you had to do is just breathe. We're quickly approaching the midpoint of the Winter season in Michigan. I noticed it the other day while walking in the woods. Although the temperature was still a chilly 21 degrees, the sun beamed its rays down upon a sleeping earth from a nearly cloudless sky, possibly causing the sharp, crisp songs to flow from the beaks of many of the local birds. It was as if nature was celebrating the promise of a new, vibrant Spring on the horizon. I had over an hour to spend in the woods before I was scheduled to pick up my husband from the community center after his swimming workout. With this abundance of time, once in the woods I decided to get off the beaten path and walk along a narrow footpath that meandered deeper into the woods. The wildlife is more apparent here and the woods itself much denser. I was admiring the stark beauty of the naked trees in various stages of growth when I once again spotted those familiar saucer-like eyes. About four yards in front of me, just to the right of the path, stood a precious young deer. I stopped immediately and inhaled the gift of this chance meeting. But this was only the beginning of the magic that would unfold. After a short connection with this gentle creature, the deer proceeded to cross the footpath in front of me. It was only then that I noticed another deer following this little leader, and then came another one, and another one, and another one. In total eight deer, one by one, had emerged from one side of the footpath, crossing over to the other side, many stopping to briefly acknowledge my presence. It felt as if I was witnessing solemn procession as they paraded in front of me, moving ever so slowly and deliberately. Suddenly I felt the sacredness of the ground, their ground, their home. In some ways by stopping and "allowing" them to cross in front of me, it also felt like I was honoring the deer and this sacredness of their home. After the last of the eight, a very young deer not far from the fawn stage, had passed I carefully moved forward so as not to disturb them, for they had settled close by to nibble on what nature had to offer. I felt privileged that they weren't alarmed by my presence but felt quite confortable with my close proximitry. I was part of their lives for a few short minutes and they were part of mine. I'm not sure what it is about having such close encounters with nature that touches my heart so deeply but I know it changes me even down to the cellular level. It's as if life itself expands to embrace so much more than what we focus on each day. And it's this expansion that gives me hope and lifts my spirit. So sometime soon expand your life by drinking in the gift of nature. Recently I had the opportunity to spend an extra long time, about two hours, walking in the woods. It was one of those days when the thick grey clouds and cold temperatures discouraged many people from visiting the wooded park, leaving me quite alone with my thoughts and the peaceful beauty of all that the woods had to offer. Perhaps it was this peaceful beauty, this all-is-well feeling, that encouraged me to try something new and climb to the top of a steep, towering hill that adjoined the path. At the top of this relatively monumental climb was a stunning view that reached for miles and miles into the distance. Witnessing this epansive view made the arduous climb well worth it even though it took my body some time to recover. Next on my adventure was following the mountain bike trail back to level ground. Since it was during the week, and in winter, the mountain bikers were virtually non-existent. 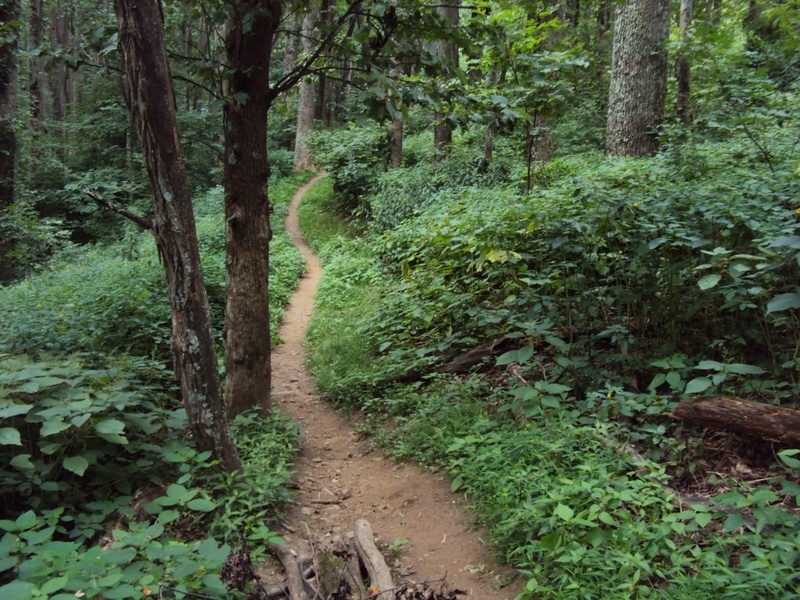 This allowed the trail to now became a hiker's paradise with twists and turns, peaks and valleys bringing an ever-changing scenery to the delight of those who ventured onto it. It wasn't long before I spotted a few deer standing elegantly among the tall trees. Their gentle nature and saucer-like eyes never fail to put a smile on my face. Our encounter was brief as my presence seemed to cause them to move on, but as the trail turned around a hill, our paths crossed once again. And again they moved on and again our paths crossed. It began to feel like we were playing a game of hide and seek and I laughed at this thought. You couldn't ask for a better background to play such a game. Before long I was once again on level ground and began to encounter a variety of nature lovers. First there was the biker who I would meet again later, then came the dog walker followed by the bird watcher and finally the group of photographers. There is a frequently-appearing owl that likes to hold court in one of the trees and attracks many to this particular area of the woods. What occurred to me after short interactions with each of these nature enthusiasts was that they were not just in nature, but they were all fully engaged with their surroundings, appreciating its beauty and inhaling its calming energy. Each sported a wide smile and a vivacious attitude, totally absorbed in their chosen pursuit. They were all so happy enjoying the ever-present now to the fullest. There's always so much to enjoy in the woods. It's relaxing ambience entices you to leave behind the busyness of life in general and embrace the simple things in life. In this manner, it's the perfect place to exercise. You don't need fancy equipment or the latest sports apparel to have fun and get active. You don't need to join a gym either. The ever-changing scenery and endless variety of experiences in the woods can keep you motivated more than any personal trainer ever could. The fun, pleasure, joy and ecitement are all waiting for you. All you have to do is show up and walk your way into a new experience. Happy exercising!